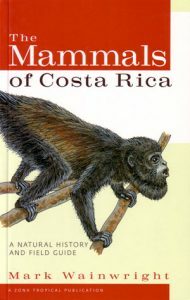 The mammals of Costa Rica: a natural history and field guide. This book describes all of Costa Rica’s readily identifiable terrestrial and freshwater mammals. The mammal descriptions include key identification features, range maps, vocalizations, local folklore and mythology, and comprehensive information about natural history and conservation. The colour illustrations show not only the mammals but also their tracks, foods and skulls. Also included are illustrations of numerous other animals and plants with which the mammals have close ecological links. Also available in hardcover [stock id 26196]. Artist/Author: de la Rosa, Carlos L. and Claudia C. Nocke. 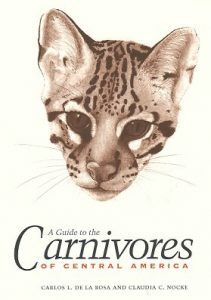 One of the first field guides dedicated to the carnivores of Central America. It describes the four families and the individual species that occur in the region. Hardcover out of print. This book is one of the first field guides dedicated to the carnivores of Central America. It describes the four indigenous families-wild cats, raccoons and their relatives, skunks and their relatives, and wild canids-and their individual species that live in the region. The authors introduce each species by recounting a first-person encounter with it, followed by concise explanations of its taxonomy, scientific name, English and Spanish common names, habitat, natural history, and conservation status. Range maps show the animal’s past and current distribution, while Claudia Nocke’s black-and-white drawings portray it visually.